Earlier this month I had the opportunity to attend a master class with Makeup Artist Julie Begin. I haven't had the time recently to do "faces" as much because I work full-time (all the time) but I love hearing tips and tricks from others. The class was around 12 people and lasted three hours. Look for inspiration in everyday things. Don't be afraid to try something out of the box. Keep a notebook to record your thoughts so you don't forget them. You don't need expensive products to do a look. My favourite part was looking into her kit. I LOVE looking into other MUA's kits for products to use on myself or others. She even took products out of her kit and let us swatch it and try it out. Some of her favourites are MAC, Annabelle, L'oreal and MUFE. Plus there was a model there which she used to demonstrated two looks on. We also had the opportunity to ask questions any time throughout the whole class. The classes are $300 USD (which may be a lot for some) but being an MUA is a "pricey" profession so the price doesn't surprise me. Especially from someone who has clients such as Balenciaga, John Galliano and Mark Jacobs. If you're in Canada ignore the cold right now. Summer is coming! It's a little late but it's better to be prepared ahead of time. I know that you can go to the salon to get all the above done but what about the times when your too busy or strapped for cash. You do it on your own! 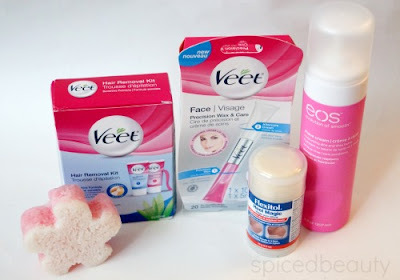 Check out these products to help you look fab this summer! First up is foot care! This is one of the most commonly ignored parts of the body. No you can not slap on some polish on the toes and call it a day! What about your heels?!?! Nothing makes more queasy than seeing crusty heels. Yes I said it! I'm being honest. If you can't make it to the salon regularly try Spongeables Pedi-Scrub Foot Buffer Lavender and Tea Tree Oil ($7.99 CAN). A new patent-pending technology foam-release system with aromatherapy, Pedi-Scrub is a unique blend of glycerin, olive oil, shea butter, tea tree extract with lavender aromatherapy infused into a double sided sponge to exfoliate, smooth and relax your tired feet. Your feet will never feel the same again! Guaranteed for 15+ washes! To hydrate your heels try Flexitol Heel Magic ($14.99 CAN)! 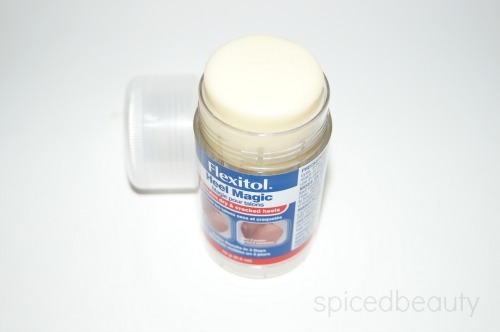 Flexitol Heel Magic is an innovative new way to hydrate dry, cracked heels and feet. This easy to use, no mess stick format contains a unique blend of emollients and moisturizers including Urea, Shea Butter, Lanolin and Olive Oil in a highly concentrated moisturizing base. Now on to hair removal! Hello tank tops! 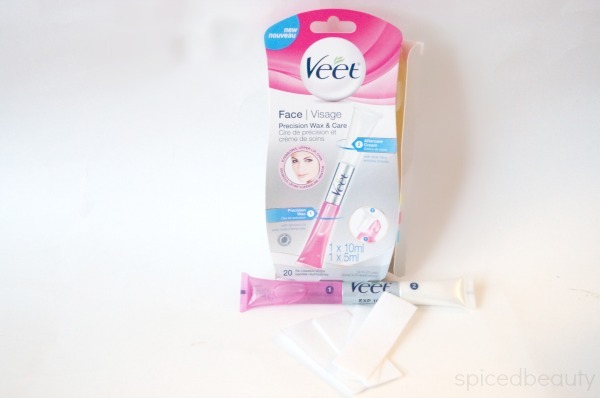 Underarm hair removal is pretty easy with this VEET Underarm Hair Removal Kit. I love the fact that it's not messy. Apply/remove it with a spatula then apply the gentle finishing cream after. 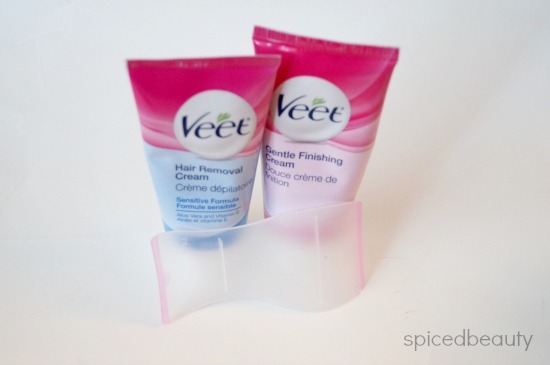 VEET’s Hair Removal Cream leaves skin feeling smooth and silky-soft for up to one week with no risk of nicks and cuts. Get rid of that upper lip hair! Try VEET Precision Wax & Care ($16.99 CAN). Waxing scares me but I can take it in small doses. The cream contains aloe vera which is soothing for your upper lip. Specially developed for facial hair removal, the easy-to-use tube lets you apply a precise amount of wax exactly where you need it – eyebrows, upper lip, and chin.Pamper your skin afterwards with our Aftercare Cream enriched with Aloe Vera. The result – your skin will be left feeling not just smooth but moisturised too. If you're a good ole fashioned girl who likes to shave. 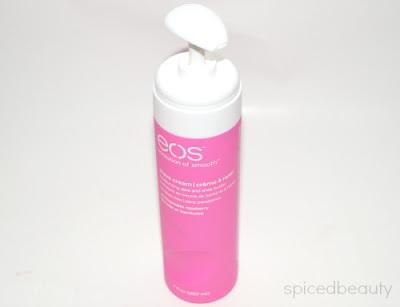 Try the EOS Ultra Moisturizing Shave Cream ($3.99 CAN)! I personally prefer this nozzle over the typical shaving cream nozzles. Also this formula is not foaming- so it's rich and a little bit goes a long way. Ladies, I hope this posts helps. Please let me know if you would like me to do more! Celebrate Mother's day with Topbox! This year they are launching their Mother's Day Topbox+1. This year it's a little different the box comes with 6 perfume samples plus a eGift Card. 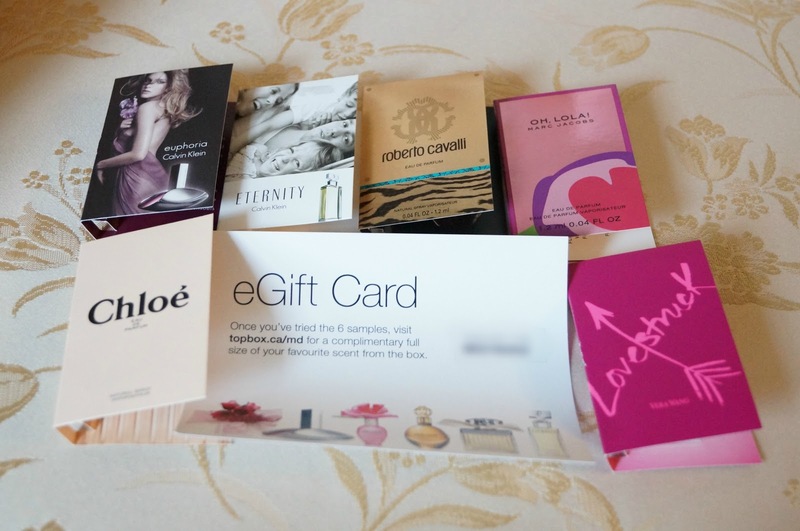 The gift card allows you to get one full size perfumes in full size from Topbox( $104 value). What mom wouldn't love that! There is a one time shipping fee of $5.95. The first time they send the box too you and again then redeem your voucher for a full size bottle of their favourite fragrance from the box. Topbox is giving one Canadian Spiced Beauty reader the opportunity to WIN a BOX for your MOM! I think everyone has one lipstick shade which they love seeing on other people but are not sure if it would look "you". That's how I felt when I saw MAC Diva for the first time. For anyone who doesn't know what Diva looks like it's a deep burgundy with a matte finish. Whether you are a red lipstick wearer or not, now is a perfect time to one try it out! 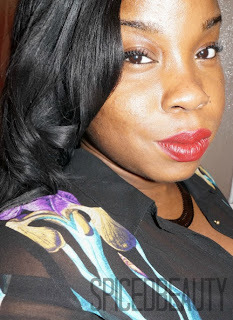 Summer is coming up and there a lot more outings to attend and try out a deep red look! I've met several girls who tell me red is not for them. My advice is "You haven't found the right one yet!”. When you’re inside a store try swiping the lipsticks on the inner part of wrist. Why? Because your undertone shows up the best in that area. Once you have done that, compare the colors and choose one that works for you. To end my post: I present you with my favourite deep lipsticks worn my Rihanna. 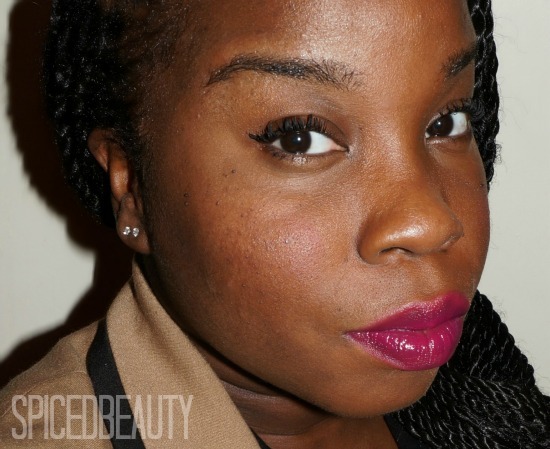 I know that we're not the same skin tone but she looks amazing in these lipsticks! Are you a fan of deep red lipsticks? I'm joking! It's been a while since I've been generally obsessed with a lotion. I've known about this product since 2012 and I've been in awe ever since. 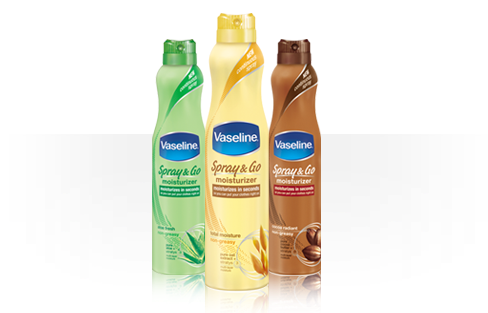 Vaseline® Spray & Go® Moisturizer ($7.99 CAN) is a line of quick, convenient, continuous-spray lotions. They moisturize deeply and absorb in seconds to leave skin instantly soft, not greasy or sticky. No words can explain how amazing this product it. After you come out of the shower, spray it on yourself rub it in and it absorbs quickly. 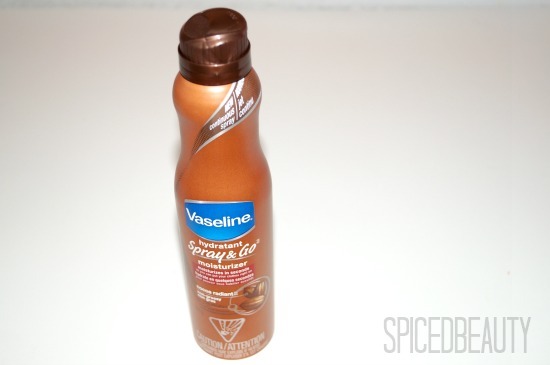 You never have to worry about the fact that you used too much lotion or the nozzle broke off! Don't ask me about the last one..haha. Cocoa Radiant variety is infused with pure cocoa butter for healthy glowing skin in seconds! Plus it comes in three different "scents" that works with your skin type. Lip butters are really popular right now. They provide hydration, shine and with a tinted finish. 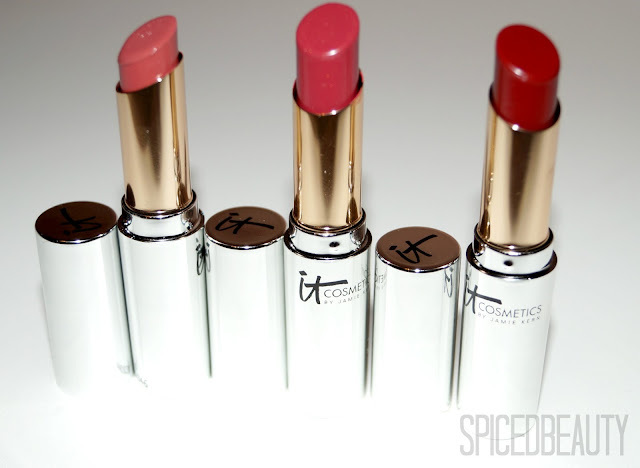 Check out these Vitality Lip Flush Butters from It Cosmetics ($20.00 US). The truly innovative formula contains ingredients such as plum oil, cherry oil, shea butter, aloe, and jojoba that all work together to treat, hydrate, condition, and nourish your lips, minimizing the appearance of lip lines and wrinkles. Plus, Vitality Lip Flush Lipstick Butters are packed with antioxidants, including vitamins A, C, and E, acai, green tea, and white tea that provide protection from wrinkle-causing free radicals. Since I have pigmented lips, I never reach for a lip butter for colour. I use them more for moisturizing lips when dry. The formula is light but silky. One of the common misconceptions about lip butters is that are that they are suppose to be vivid like lipsticks when in actuality they are sheer. 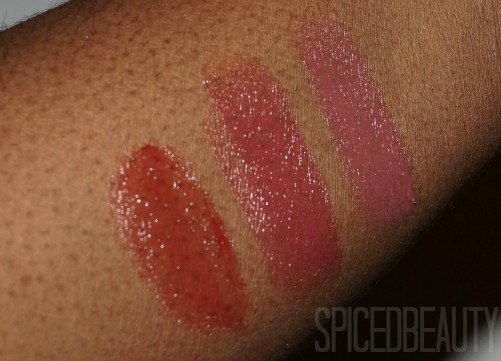 In the swatch below, I swiped the lipsticks three times. That is not now it appears on my lips (my lips are darker than my wrist) but I wanted to give you all an idea of the consistency. They are very glossy and smooth. These were swatched three times. I should also add that these glosses are paraben-free! Are you a fan of lip butters? It's been a while since I've tried anything from Fruit & Passion. I was excited to try out the Pompelmo collection because it's a unique mix of scents. 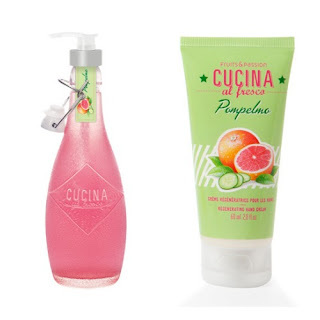 The Cucina Al Fresco collection from Fruits & Passion now includes Pompelmo, a fresh and delicately aromatic new fragrance. Pompelmo, which is Italian for grapefruit, takes you straight to the heart of summer. Its accents of crisp green cucumber combine with refreshingly delightful pink lemonade. How cute is the hand soap bottle! I love the fact that it's glass and reusable. Plus the formula contains olive oil, "A traditional emollient that nourishes and helps protect skin by infusing it with essential fatty acids, olive oil creates a protective barrier to moisturize, soften and smooth skin." I received the hand soap & hand cream but the line also features a foaming hand soap, discovery candle, fragrant kitchen mist and a decorative diffuser fragrance. The line ranges from $2.00 to $28.50 CAN. Available March 25 to June 9, 2013. 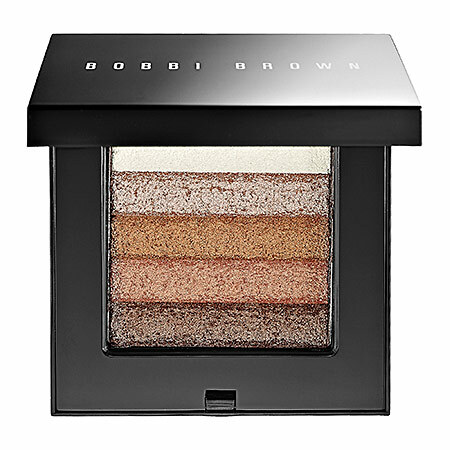 20% of all orders placed through the new BobbiBrown.ca site starting this Monday, April 15th through the 18th. Customers will also be helping to support Bobbi’s favorite charity, Dress for Success Worldwide, as a total contribution of $10K from the sales made online during this time period will be donated to the organization. Powerfully feminine look with glowing shots of colour, inspired by the mood and energy of the Burberry Prorsum spring/summer 2013 runway collection. Reds are back for Spring/Summer! 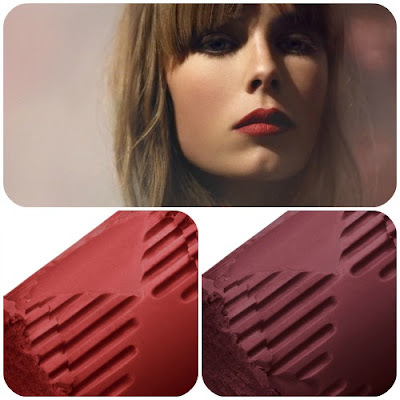 Shown below are Burberry Lip Velvet lipsticks ($30.00) in Military Red & Bright Poppy. The velvet lipsticks are definitely on my must have list because they have a velvety matte consistency. One of my favourite finishes! I started my blog for anyone who wanted to get into makeup but didn't know where to start. Believe it or not, I found a foundation that perfectly matched my skin tone when I was 24. That was only three years ago. It was actually Make Up For Ever HD foundation in 178. Perfect foundation that works with daylight & harsh flash. The hardest part in the beginning is trying to find which shade would suit your skin tone. It's always good to start in places which offer samples like Sephora or MAC. Since there is a lot of trial and error at first, it's always good check up on blogs to get an idea of what you want. 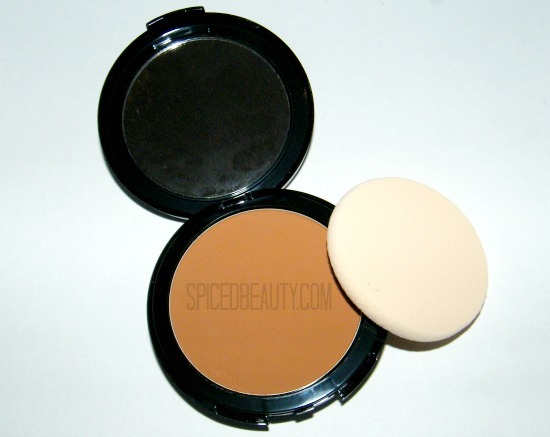 I can't remember who it was but I seen a Youtuber with a similar skin tone to mine demo the MUFE HD formula. I went into the store and picked up exactly what I wanted. Are you warm or cool based? This part is kind of difficult for some. Warm based skin has a yellow undertone. Cool based skin has a blue undertone. I'm a yellow undertone with a little bit of red. Get it? If you don’t pop into the closest department store and someone will definitely help you out. Maybe they can apply it directly to your face. Always swipe the product on the side of your jaw. Does the product match your skin? If so, congrats you have a match! If it doesn't, keep on trying other brands until you find a suitable product. This one is truly based on trial and error. I prefer liquid foundation but lately I'm in love with matte powders (with no primer). I love the way how it sets naturally on my skin. 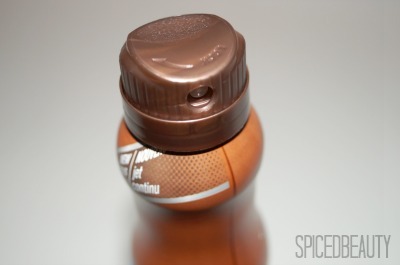 If I'm in a rush I spray it to get the desired look I want. Do you have any tips on finding the right foundation? Summer is coming and skincare is at the top of my list. 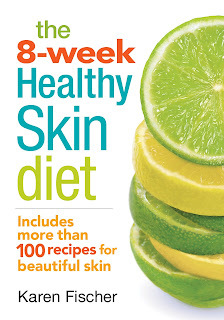 I recently had the opportunity to check out Karen Fisher's book: The 8-Week Healthy Skin Diet. KAREN FISCHER is a former model, award-winning author, and a nutritionist who believes that the skin’s appearance is one of the main indicators of overall health. 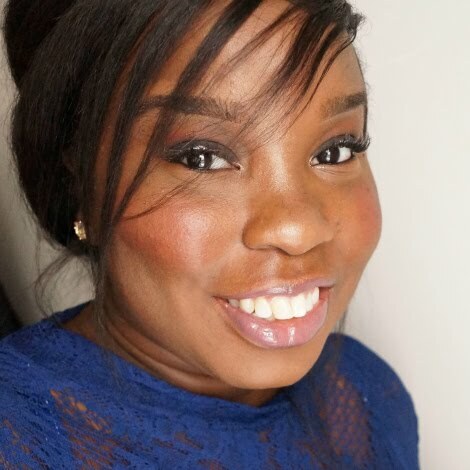 For the last decade Karen has helped hundreds of patients gain beautiful skin, and has made it her goal to make nutrition and health interesting and accessible to everyone. What is your skin trying to tell you? The recipe for beautiful skin begins in the kitchen, with foods matched to your specific skin problem and type. 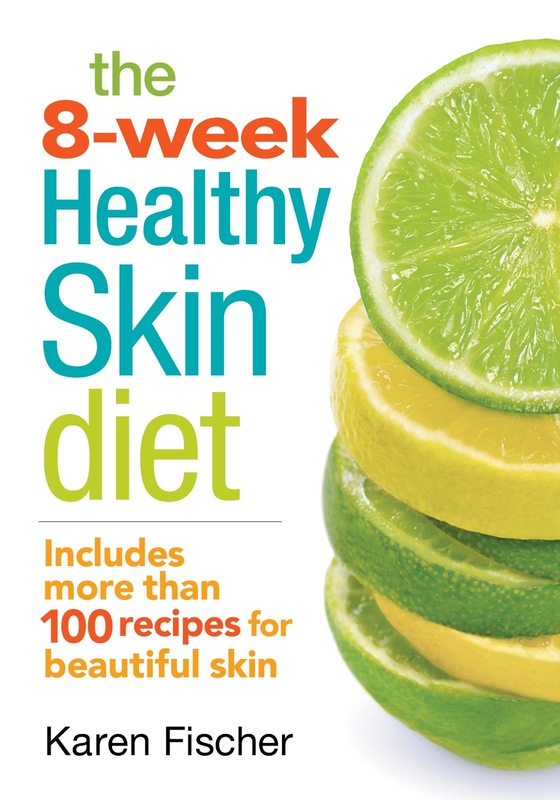 The Healthy Skin Diet is not one-size-fits-all – it’s as unique as you! Whatever your skin type, whatever your skin condition, you’ll find all the help you need right here. 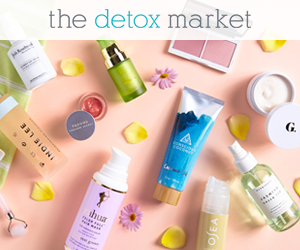 And whether the health of your skin is just okay or out of control, you can be looking fantastic within eight weeks simply by following this holistic, natural approach. I loved how the book was broken down into different sections. It also has a lot of variety such as interesting facts, questionnaires, case studies & recipes! Everyone can gain health benefits from following the Healthy Skin Diet because it is a common-sense diet and lifestyle program designed to fit into your life. Because it’s so flexible and easy to follow, you have no excuse not to complete the eight-week diet. It’s an anti-inflammatory eating program that was originally developed for people with eczema and then was discovered to also be highly effective in treating the following skin conditions: psoriasis, rosacea, dandruff, acne, cellulite, hives, premature aging and wrinkles, dull/sallow complexion, bags under the eyes, pigmentation, dark circles under the eyes, hives and dermatitis/contact dermatitis. Divide the mango slices into four small containers and freeze. Before serving, sprinkle with flax seeds. This book is definitely a good read if you deal with problems such as food intolerances or poor immunity to colds/flus. You can purchase this book from any local bookstore or from any online retailer (ie: Indigo, Amazon, etc). Target is finally in Canada! For beauty lovers like me, they bring a lot of products to Canada that we don't have access to. They also carry cruelty-free brands such as Kiss my face! Kiss My Face all-natural body care company is no newcomer to the recent explosion of green product marketers. The brainchild of two long-time vegetarians searching for healthy body care products, Kiss My Face was founded on a 200-acre organic farm in the early 1980's. The latest scientific research combined with the most effective ingredients nature has to offer leaves no room in Kiss My Face products for artificial colors, unnecessary chemical additives, animal ingredients or animal testing. From moisturizers to liquid soaps, shower gels to toothpastes, shaves to deodorants, Kiss My Face has products that are effective and cruelty-free! I know that some of my readers live a vegan/cruelty-free lifestyle. So products from Kiss My Face would be perfect for you. If I were to describe the products in one word it would be Gentle. 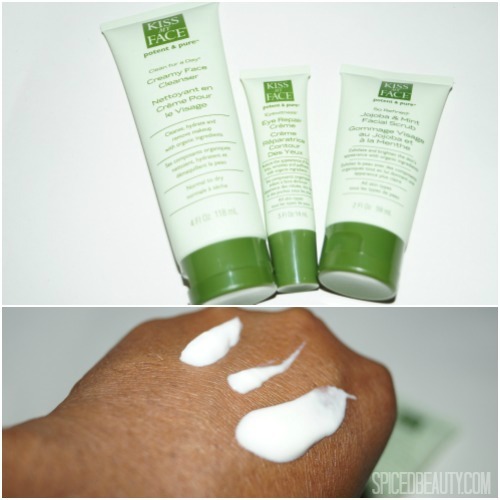 Exfoliate and polish the skin's appearance with natural and organic ingredients. This non-drying, natural humectant gently exfoliates and purifies skin by removing dirt with organic jojoba beads and other natural and organic herbs and plant oils. Helps skin look visibly younger and refreshed. I personally would call this product more of a cleanser than a scrub because the beads are really small. I prefer larger particles in my scrubs. Reduce the appearance of fine lines, dark circles and puffiness with potent natural and organic ingredients. Smooth the appearance of wrinkles and moisturize the delicate skin around your eyes. Natural and organic oils and butters leave skin looking hydrated and rejuvenated. The eye cream was pretty lightweight. Since I don't any issues with my under eye area, I don't reach for eye creams as much as I should. It's probably better to start now to prevent any problems later. Cleanse, hydrate and remove makeup with our natural botanical cleanser. 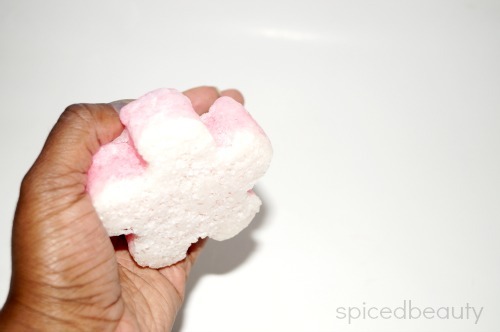 This soap-free, non-drying formula uses natural cleansing agents from sugar and corn to remove dirt and debris. Rich in natural and certified organic ingredients, the soothing scent of vanilla and tangerine will heighten your senses. Out of the three products, my favourite would be the Creamy face cleanser. Since it's a soap free product, I found it quite hydrating. Plus it had a pleasant scent. Have you tried Kiss My Face products before? This weather is really getting the best of me. I WAS getting better now I'm back to being sick. Thankfully it's not the flu this time. I have soo many products to showcase but I know my health comes first. How do you all feel about high-end lipsticks? Personally, I'm the type of person who really doesn't care about price. I can use a $2.00 lipstick or a $40.00 one. It doesn't matter to me as long as it does the job. 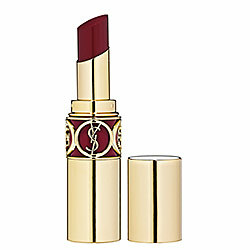 I was really interested in trying the YSL ROUGE VOLUPTÉ line after seeing all the buzz on twitter. On one of my Murale trips, I swatched YSL Rouge Volupté Silky Sensual Radiant Lipstick in “Color 12 Forbidden Burgundy”($34.00 CAN) and I had to take it home! I love how creamy and pigmented the formula is! Now, I want to go back and get more colours! Do you have a favourite YSL lipstick?